There are some programs that just do something really handy in a simple way that makes your life easier. Library Books is one of them. “Library Books is an Mac OS X application that tracks the library books you have borrowed.” Yes, this is true, but that just makes it sound like a database. Not at all. The software connects to your library’s system and automatically shows you which books you have checked out, when they are due, etc. It puts status information in your Mac’s menu bar. For example, when I first installed it, I had no books checked out, but I had a few holds set up. The software put a star and a zero in my menu bar. Then the next day I noticed the star was green. I clicked, and a pop-up menu appeared that said “9 holds, 2 available.” This was more than a day before the library actually got around to sending me the e-mailed notice that my holds were available! So I checked out the books, then went home, and noticed shortly afterward that my menu bar now said “✮ 2” because I had two books checked out. Clicking on the star pops up a list of the books and their due dates. It’s all automatic, which is great for me because I am absent-minded. Sorry for the blur. This is the felted laptop sleeve for my Macbook, currently drying. It felted down to the right size, so my math worked! I think it could probably felt slightly more, because I can still see the vertical “grain” where the stitches were, but I can live with this. The top is held together with safety pins so that it will dry tall enough. The rubber bands are not part of this project — they are on the safety pins for another project, so I left them there. That is NOT the Macbook in there. It’s two books that were about Macbook size, sealed in a plastic bag. I did not want to risk my Macbook getting moisture damage! 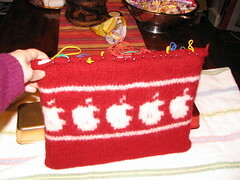 One note, the slight reddish bit in some of the apples is because I was weaving the strands in while I was knitting. This turned out to be a bad idea because now you can see the red yarn through the white. So if you knit one of these, don’t do that. :/ Maybe I will embroider something over those later, like initials or something. I don’t know. 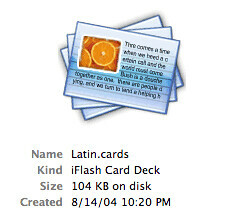 Tood Bishop at the Seattle P-I collected speeches, interviews, e-mails, and other items from Microsoft’s history, then processed them with a tag cloud generator to show the words used most commonly in each document. Above, I’ve listed the 2-4 most common in a few of the them, but there are lots more, and each one in the P-I’s tag clouds includes 64 words. It’s a fascinating glimpse at the evolution of the company and the things that they have focused on over the years. I must have this sweater! It’s a Sad Mac. But a Happy Mac would be nice, too. It’s crocheted, but I bet I could figure out a knitted one. I might just do that! Kung-Tunes is an OS X program that makes it possible to generate a list of your most-recently-heard iTunes tracks, and post them automatically on a web page. So, with some script help from Tim’s Bandwagon, I’ve got the thing up and running on this very page. Look in the menu bar (scroll down) to see what I’ve been listening to, and try not to be too appalled at my taste in music. I’ve been listening to an awful lot of cheesy pop from my junior high years lately. That’s what the iTunes music store is great for — buying the singles you’d otherwise never touch in album form. I would love it if someone could tell me why, when viewing this site through the Lemony Yellow theme, certain headlines look different from the rest. The Julius Schwartz headline and the Cola Through the Ages headline both aren’t showing the H3 style. But when I look at the code they look the same as the other headlines. Any CSS whizzes out there who can tell me what I’m missing? Originally the H3s did all look the same, so I must have broken it, but I’m not seeing what I did. If you are also running WordPress and being affected by comment spammers, you might want to read this thread on the WordPress support board. So, Apple has finally done the right thing and created a program to cover the replacement of the defective logic boards in certain iBooks. Which is good, and they should have done it a long time ago. However, I see from reading this announcement that I am doomed. My iBook’s serial number is included in the group of covered iBooks. I wonder what the percentage of iBooks with this problem is, and the likelihood that mine will fail. It’s great that Apple will fix it for free if it happens, but I certainly don’t want to lose the use of the iBook for days or longer while the work is done. I am crossing my fingers. Well, the upgrade is running. The basic upgrade to a functional 1.0.1 (from 0.72) was easy. The killer was that they decided to change names of a bunch of files and functions, from b2* to wp*. This, of course, broke the customizations I had done. Even the style sheets I had made broke, though they shouldn’t have. I know they wanted to get rid of all the b2 file names, but… I would have preferred not to have to spend the evening redoing my CSS and the HTML of the index page. At least the files are all wp now, so with luck I won’t have to do this again. Incidentally, there is a WordPress Documentation Wiki, which I had not seen before. Seems useful. While I was out of town a new version of WordPress came out. I haven’t had time to think about upgrading, but I think I might try to upgrade tonight. So there might be some weirdness. I expect the templates might break temporarily. If things aren’t working, check back later. Good timing, Amazon. During this holiday shopping season, they changed the format of their wish list URLs — thus breaking links on pages all over the web, including mine. At least I found out (via the eclecticism blog) and got it fixed. (It’s in the menu bar, hint hint). Well, I finally took the plunge and imported 3 years’ worth of old Blogger posts into WordPress. And guess what? It was easy! Seems to have worked fine. If you’re running WordPress and you’re not sure how to do it, just look in your wp-admin folder, and you’ll see a php script (import-blogger.php) for importing Blogger stuff. Load this page in your web browser, and read the instructions. It’s all pretty straightforward. Anyway, now you can read the old posts right here in the main site, and even better, you can search them. Have fun.